Ski boots that climb like technical alpine boots. 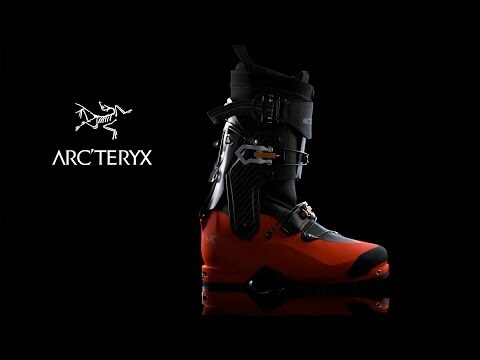 Arc'teryx found the sweet spot for ski mountaineers, building a carbon fibre boot that melds ski tech with climbing agility. The upper cuff uses 2 pieces that pivot for an exceptional range of motion, so you can place your crampon points precisely and get lots of skin surface on the snow when a traverse gets technical. In ski mode, the spoiler snugs the upper cuff to prevent the lateral movement that's only useful when climbing. Fully snowproof and highly water resistant, the shells are equipped with a hybrid closure system to distribute pressure and keep you locked in. Procline Support liners are heat mouldable, giving aggressive skiers the drive to climb and conquer couloirs. Cuff is made of stiff, light and durable 30% carbon charged Grilamid. Spoiler is 60% fiberglass with Grilamid for optimal weight to stiffness ratio. 360° rotating cuff offers 75° of vertical rotation and 23° and 12° of internal and external rotation respectively. Hybrid closure system pairs the load-spreading ability of cable systems with an aluminum buckle to secure the tension. Closure system keeps buckles out of the way in tight places. Cam Lock power strap is secure, powerful, and doesn't use abrasive Velcro®, so it won't shred your pants. Full coverage gaiter keeps snow and water out, thanks to the durable Cordura with PVC coating and laminated TPU reinforcement. Fully-mouldable Procline Support Liner focuses support and power transfer on the descent while remaining agile on the climb. Reduced shell length, rockered sole and a crampon optimized toe offer great climbing perofrmance. Rubber toe cap provides protection and added grip when climbing. Tech inserts are Dynafit Certified. Mountaineering outsole is made by Vibram. Toe and heel welt are compatible with automatic or semi-automatic crampons. Boot is compatible with tech bindings only.